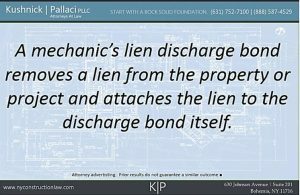 What is a mechanic’s lien discharge bond? “What is a mechanic’s lien discharge bond?” This question often confuses and perplexes construction professionals and inexperienced attorneys alike. Here at Kushnick Pallaci we often receive phone calls inquiring about the process for bonding a mechanic’s lien or inquiries from those of have just received a discharge bond and don’t know what it is. Often the caller has one of the following problems: 1) he or she has not been able to get any information about the process of bonding a mechanic’s lien; 2) he or she has received the wrong information about the process for bonding a mechanic’s lien; or 3) he or she has received conflicting information about the process for bonding a mechanic’s lien and is not sure who is right. A bond to discharge a mechanic’s lien is not as mystifying of a process as it can be made out to be when you are asking someone that doesn’t know what they are talking about. The two most common people that need to obtain a discharge bond are the property owner and the project general contractor (who is usually contractually obligated to discharge any mechanic’s liens filed by suppliers or subcontractors). A source of some of the confusion may be due to the fact that there are a few types of bonds out there that tie in with construction. For example, in addition to the bond to discharge a mechanic’s lien, there are also payment bonds, bid bonds, maintenance bonds and performance bonds (each of which serves an entirely different purpose than the bond to discharge a mechanic’s lien). 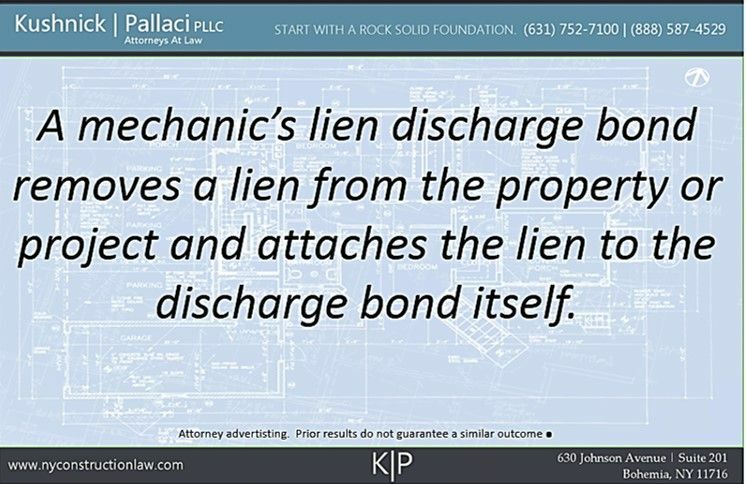 A mechanic’s lien discharge bond serves one simple and particular purpose: it removes the mechanic’s lien from a parcel of real property (or public project) and, in essence, the mechanic’s lien then attaches to the bond until it is discharged some other way or satisfied. A discharge bond is governed by Lien Law Section 19(4). Pursuant to Lien Law Section 19(4), a mechanic’s lien may be discharged by posting a bond equal to 110% of the face value of the mechanic’s lien. This answers one of the most common questions – how much does it cost to bond a mechanic’s lien? The answer is that it always depends on the amount of the lien, but always will require at least 110% of the lien face value. It does not matter what surety you use to obtain the bond, they all must issue a bond in the amount of 110% of the face value. The only area where cost can vary is in the premium that the surety charges you to issue the bond. The premium is, of course, based upon the amount of the lien. So the cost to bond a mechanic’s lien equals 110% of the face value of the lien plus the surety’s premium. The construction attorneys at Kushnick Pallaci are experienced in obtaining, filing and enforcing and defending claims against mechanic’s lien discharge bonds. Feel free to contact us to discuss whether we can help with your bond issue. This entry was posted in Discharge Bond, Mechanic's Liens, Public Improvement Lien and tagged Bonds, Discharge Bond, Liens, Public Improvement Liens by VTP. Bookmark the permalink.